During a season, I hosted a weekly livestream about digital painting and Krita on Youtube. It was working on the pages of Pepper&Carrot. Sometimes doing an artwork, sometimes inking a panel, sometimes coloring. I interacted with the questions of the audience via the chat. I had to stop the livestream after I moved to a new house with a low speed internet connection. I hope you'll like to watch the replay. License: CC-BY David Revoy, www.davidrevoy.com, 26 february 2018 . This is going to be the best part of the week! I don't think anything else can get me excited as this. 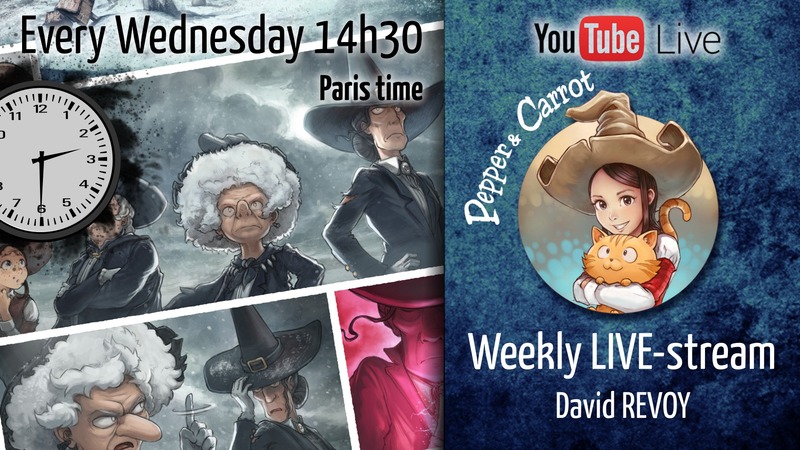 "weekly working on my pages of Pepper&Carrot" so should I expect spoilers when watching it? Yes. I will not show all the page, but for example ; tomorrow I'll color page 3. So, it's a sequence where you'll see part of the episode action. But without the start and the end, it's hard to have an idea what is going on , in my opinion. Just be careful what license you provide for your videos on youtube. If you use "Standard youtube license" it is no use that you have CC-BY in the end of your video. In fact, it does not matter in the youtube perspective, because you agree with youtube TOS and they have the copyright unless you set it to CC. I was also watching it live a bit and know it didnt' start like that, the landscape and characters came from a sketchbook but were drawn separately, iirc. Yes, I confirm ; it looks like a bug because the stream was well of 3h30min. I think it's a issue on Youtube server; I already had that with the first 2h28 long streaming who get cut at 2h during the first couple of days. Exactly, it was painted almost from scratch ( from a scan of a sketchbook). I'll keep an eye on it... I think it's a refresh issue. I went to the video-manager interface of Youtube and decided 5min ago to do a slight little modification to the video. ( rise contrast by 1% save, then lower it back ; for return to normal ) ; I hope it will trigger a re-rendering and unlock the file ( in my manager the video is 3h30 long ). I did check with couple of other people that it wasn't just my browser or player doing that before commenting. Wouldn't want to bother you for nothing. The description said 3h30m so I had a reason to suspect you didn't cut it to 2h. Good that it's at least possible to fix it with Youtube tools, instead of just losing big portion of the video. David thanks for live stream and for share it offline. You must check last live video 2018-03-28. Recorded video start at 16,04 on your desktop clock instead 14,30. Video lenght is 2h, youtube lost first part of streaming video? Yes, see the comment above. I think I'll have to cut all streaming into 2h00 session ( or 1h30 ) , and do part1/part2 in the future. It might be simplier to digest for the Youtube server.